This map was published in Norden's 1593 'Speculum Britanniae. The first parte. An historicall and chronographicall description of Middlesex'. The map is flanked by the arms of the twelve great livery companies and features title at the top with royal and city arms. The scale bar is at top right and a key to inns, churches, halls and other prominent places feature in a panel below the plan. 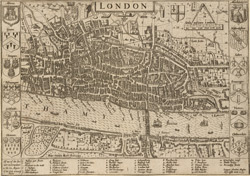 The map was intended for countrymen visiting the city and was reissued in 1623 and 1653 with enlarged tables of reference.